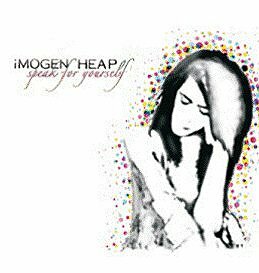 I’ve been a fan of Imogen Heap (Immi to her fans) since here debut CD, “I Megaphone”. When I got that I played it thin. I believe it’s out of print now, but thankfully, she’s released another solo CD. I also am a huge fan of Frou Frou, her collaboration with Guy Sigsworth. They’ve only released one CD, “Details” but it’s fantastic. Anyway, this is her solo recording and I am happy to say that it’s just as good as the previous stuff Imogen has been a part of. On first listen none of the songs really stood out to me. They all sounded somewhat similar to each other. Except for “Hide and Seek” which she sings with many voices a capella and with voice synthesizers. But that stood out, I think, mainly because it was odd. Upon further listings the songs started to take shape in my head and I’m now seeing them all as different parts on a grand whole. I know that an album has clicked with me the moment a song pops into my head and I realize it’s from the album…and I haven’t listened to the album in days. This one has reached that status for me. The songs are interesting and fresh, though they sound enough like her previous projects to appeal to fans of those as well. Imogen has a very interesting voice. I mean that in a good way. It’s very distinctive and I think lovely. When I first played her for a friend, the friends response was, ‘her voice is horrible! I love it!” But I think she has a great voice. It’s different, sure, but it’s very comforting sounding, at least to me. “Horrid” would be someone who can’t hit the notes. We all know some like that. Immi is spot on. If you don’t already know her music, I would suggest listening on her site before buying. Her style is unique and it may not be for everyone. But if you like the snippets you hear, you’re going to like the whole album. My favorites: “Clear the Area”, “Goodnight and Go”, and “I Am In Love With You” is super funky. I am actually loving all the songs, these are just my favorites today. Note: It’s been brought to my attention that this CD has malware on it. It’s copy-protected and Sony believes that it’s OK to download malware on your computer if you put this in. Even if you cancel the installation some stuff can still get on there. Here are some links to more info and removal options. Uninstall works on IE only unfortunately. Soothing South London bubble pop is built around slow and soft Dido with droplets of Bjork and Aimee Mann vocals that meander through this lush offering. ‘Have You Got It In You?’ is a provocative poser that features rumbling backing instrumentation, as doubts about other people’s motives are exposed. “So what do you say we give it up and walk away? Despite passing the respectability mark at least an album ago, Imogen has not lost any of her edge; deciding to shun the lure of major labels, by re-mortgaging her flat and releasing this album on her own label. Her vibrant independence shines through the sonic boom of ‘Daylight Robbery’ that possesses quivering bass lines and a nifty electro kick. The aforementioned bold decision has not affected the sound or recording quality on this offering, as Imogen continues to show the vibrant and alternative side to pop music (yes, it does exist, believe it or not?). 3. Have You Got It In You?